Skunk repellent - The favorite skunk repellent in homes across the country is mothballs. They are inexpensive, but that’s still not a reason to try them. Mothballs were formulated to kill insects. They are a mixture of an insecticide and a deodorant. They have no efficacy against any other animals other than bugs. What mothballs can do, however, is give cancer to both people and animals. If the level of mothballs is toxic to the skunk you are trying to get rid of, it’s also going to be toxic to you. So, scratch mothballs off your list of items to try. In fact, you should throw that list away completely. Professionals have determined there are no effective skunk repellents on the market. You might be wowed by the presence of ultrasonic emitters, strobe light, and sound cannons, but these items don’t do squat against skunks. 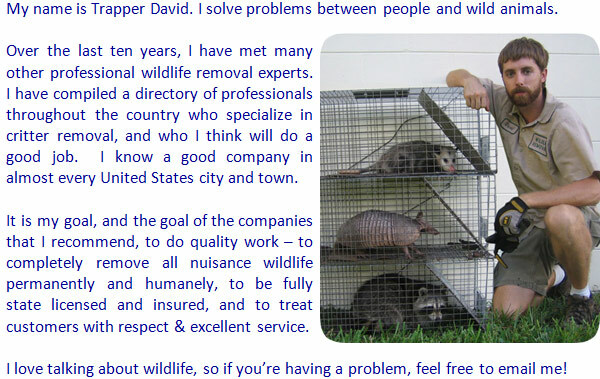 If you want the animals removed, you’re going to have to do the job yourself or hire a professional. Go back to the How To Get Rid of Skunks home page.